Should You Get Avengers: Age of Ultron on Blu-ray? Avengers: Age of Ultron is out on Blu-ray this weekend, should you get it? Stocking up on some movies for when those temperatures start dropping? Here’s what we’ll be checking out on Blu-ray this month. Avengers: Age of Ultron was a giant-size set up for future MCU movies, but with the impending release of the Blu-ray, we’re just getting started. Avengers: Age of Ultron Gets a Manga Prequel… But Is It Canon? We’re you upset when Avengers: Age of Ultron was released pretty much everywhere a week before fans stateside got to see it? Well, at least you’re not living in Japan, because it still hasn’t been released there. Did You Catch This Studio Ghibli Easter Egg in Avengers: Age of Ultron? Tony Stark has built a ton of robots over the years, but apparently at some point between the House Party Protocol and Ultron, he found the time to infringe on some copyrights. 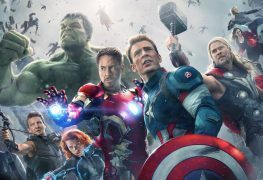 Avengers: Age of Ultron Officially Biggest Movie of 2015, Will It Remain? After it’s third week at the box office, Avengers: Age of Ultron reeled in $38.8 million. So far, it has grossed $372-million officially making it one of the biggest movies of 2015.